n the following pages the Author has placed before the reader an account of the changes in the design of Decorative Furniture and Woodwork, from the earliest period of which we have any reliable or certain record until the present time. A careful selection of illustrations has been made from examples of established authenticity, the majority of which are to be seen, either in the Museums to which reference is made, or by permission of the owners; and the representations of the different "interiors" will convey an idea of the character and disposition of the furniture of the periods to which they refer. These illustrations are arranged, so far as is possible, in chronological order, and the descriptions which accompany them are explanatory of the historical and social changes which have influenced the manners and customs, and directly or indirectly affected the Furniture of different nations. An endeavour is made to produce a "panorama" which may prove acceptable to many, who, without wishing to study the subject deeply, may desire to gain some information with reference to it generally, or with regard to some part of it, in which they may feel a particular interest. It will be obvious that within the limits of a single volume of moderate dimensions it is impossible to give more than an outline sketch of many periods of design and taste which deserve far more consideration than is here bestowed upon them; the reader is, therefore, asked to accept the first chapter, which refers to "Ancient Furniture" and covers a period of several centuries, as introductory to that which follows, rather than as a serious attempt to examine the history of the furniture during that space of time. The fourth chapter, which deals with a period of some hundred and fifty years, from the time of King James the First until that of Chippendale and his contemporaries, and the last three chapters, are more fully descriptive than some others, partly because trustworthy information as to these times is more accessible, and partly because it is probable that English readers will feel greater interest in the furniture of which they are the subject. 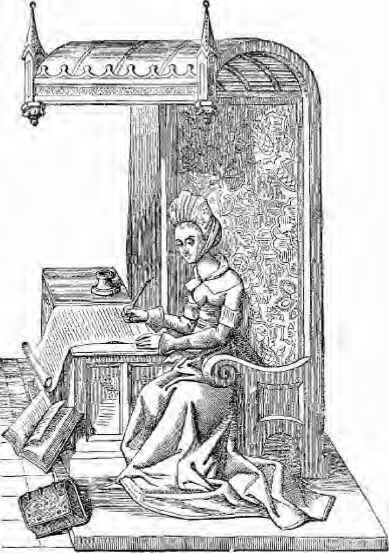 The French meubles de luxe, from the latter half of the seventeenth century until the Revolution, are also treated more fully than the furniture of other periods and countries, on account of the interest which has been manifested in this description of the cabinet maker's and metal mounter's work during the past ten or fifteen years. There is evidence of this appreciation in the enormous prices realised at notable auction sales, when such furniture has been offered for competition to wealthy connoisseurs. In order to gain a more correct idea of the design of Furniture of different periods, it has been necessary to notice the alterations in architectural styles which influenced, and were accompanied by, corresponding changes in the fashion of interior woodwork. Such comments are made with some diffidence, as it is felt that this branch of the subject would have received more fitting treatment by an architect, who was also an antiquarian, than by an antiquarian with only a limited knowledge of architecture. Some works on "Furniture" have taken the word in its French interpretation, to include everything that is "movable" in a house; other writers have combined with historical notes, critical remarks and suggestions as to the selection of Furniture. The author has not presumed to offer any such advice, and has confined his attention to a description of that which, in its more restricted sense, is understood as "Decorative Furniture and Woodwork." For his own information, and in the pursuit of his business, he has been led to investigate the causes and the approximate dates of the several changes in taste which have taken place, and has recorded them in as simple and readable a story as the difficulties of the subject permit. Numerous acts of kindness and co-operation, received while preparing the work for the press, have rendered the task very pleasant; and while the author has endeavoured to acknowledge, in a great many instances, the courtesies received, when noticing the particular occasion on which such assistance was rendered, he would desire generally to record his thanks to the owners of historic mansions, the officials of our Museums, the Clerks of City Companies, Librarians, and others, to whom he is indebted. The views of many able writers who have trodden the same field of enquiry have been adopted where they have been confirmed by the writer's experience or research, and in these cases he hopes he has not omitted to express his acknowledgments for the use he has made of them. The large number of copies subscribed for, accompanied, as many of the applications have been, by expressions of goodwill and confidence beforehand, have been very gratifying, and have afforded great encouragement during the preparation of the work. If the present venture is received in such a way as to encourage a larger effort, the writer hopes both to multiply examples and extend the area of his observations. F. L. Hanway Street, London, July, 1892.